I suspect that GCM Resources management thought that if they held their AGM this year on 28 December, deep in the heart of the Christmas-New Year break, protesters would stay away and they could have a quiet time. How wrong they were! I have been attending GCM Resources AGMs for years. They are usually much the same: company management try to explain why they have still been unable to start work on their sole project, an open pit coal mine at Phulbari in Bangladesh, despite years of trying; some shareholders try to reassure themselves that they are not going to die before they see a return on their investment; and dissident shareholders point out the enormous damage the project would do to local communities and livelihoods should it ever go ahead – as well as the catastrophic damage it would cause to the planet’s climate. (You can read some background on the company and full reports of the 2011, 2012, 2013, 2014, 2015, 2016 and 2017 AGMs elsewhere on our website.) Meanwhile, outside, a lively protest starts well before the AGM and lasts until the shareholders emerge after the end of the meeting. This year was different. I would love to be able to write a report about what happened at this year’s AGM, but I can’t. We weren’t allowed in at all, despite the fact that between us we own some shares that give us the legal right to attend and vote. We were not alone: a number of the ordinary shareholders were also excluded. In fact, judging by attendance at the last few years’ AGMs, I would say that most of the people who would have been at this year’s AGM were stuck outside the locked doors of 33 Cavendish Square, London W1, where the AGM was to take place. 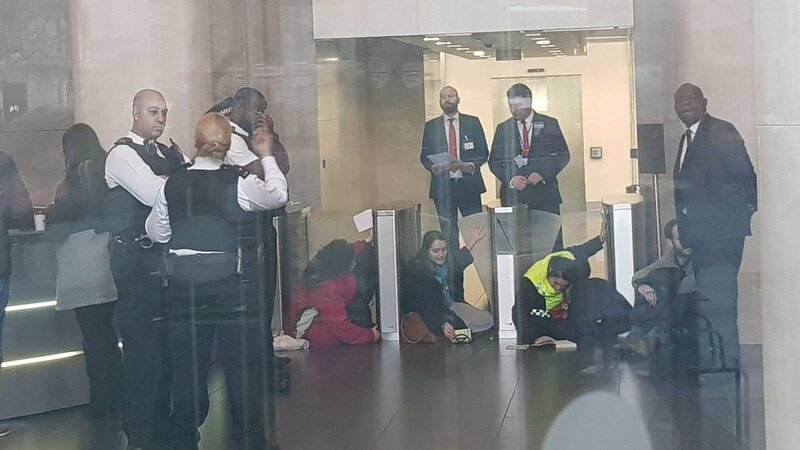 It was all because the building’s security guards over-reacted quite unnecessarily to an entirely laudable protest by some of our friends in the climate movement, who heroically glued themselves to the security barriers inside the foyer. Security personnel were most upset about this, and locked all the doors. Even people who were employed at one or other of the many entities operating from the building had a hard time getting in. I pointed out on multiple occasions that the security guards were depriving me of my legal right to attend and vote at the AGM of a company in which I held shares, but to no avail. The guards were in a melodramatic strop and unwilling to listen to reasoned argument. They could perfectly well have let shareholders in to the building through the fire exit, but chose not to do so. Meanwhile, the protest outside the building had grown to unprecedented proportions, and was particularly noisy. There were people there from Phulbari Solidarity Group, Committee to Protect Resources of Bangladesh UK Branch, Reclaim the Power, Extinction Rebellion and other groups. The ordinary shareholders who were not being allowed in were very cross indeed. I heard one of them on the phone to GCM’s Chief Executive Gary Lye, who I assume was inside the building for the meeting. The shareholder sounded pretty cross with him. He was trapped outside the door with lots of “stupid protesters”, he said. To help pass the time of day, some of the protesters chatted amicably with the ordinary shareholders about the inadvisability of investing in GCM. This only seemed to make them even crosser. One conversation I overheard was particularly revealing: the shareholder said that because (he claimed) 90% of history teachers used to be Marxists, and now only a handful were, we could be confident that soon the overwhelming majority of climate scientists would give up their absurd and erroneous belief that carbon emissions from human activities were endangering the global climate. Goodness, what a relief! Unfortunately, even if they do change their beliefs, the melting ice caps and glaciers may not alter their activities. We learnt later that the AGM did take place – though apparently Chairman Michael Tang did not even bother turning up, as he had something more important to do. GCM only requires a quorum of, if I remember correctly, three shareholders for the AGM to be legally valid, so even though there were about a dozen of us outside trying to get in, we probably cannot challenge the outcome of the meeting. Results were posted online before noon. As usual, all resolutions were passed. We remained protesting outside until police and medics had arrived in sufficient number to unglue the activists inside the building, arrest them and carry them away. By that time nobody in or around the building could have been unaware of GCM Resources, the Phulbari project, and why the project should be abandoned. Some of our friends then departed to offer the necessary legal and moral support to those who had been arrested. If we had managed to get in to the AGM, we would have presented a statement from 134 community leaders from 50 communities around Phulbari, objecting to GCM’s proposed coal mine, as well as asked a number of questions (see below). 1. It has been 12 years since the project was halted in Phulbari, where three people were shot dead and over two hundred injured in a demonstration of some 80,000 people in 2006 for opposing plans by GCM’s Bangladesh subsidiary, Asia Energy. Since then the people in Phulbari and across Bangladesh have been resisting your idea of an open cast mine project. The government has repeatedly declined to renew GCM’s licence. When entering the building we met community protesters and eye-witnesses from Phulbari and Bangladesh who are shouting that the company is unwanted in Bangladesh. The community leaders from Phulbari, Boropukuria and the whole Dinajpur region have sent us a letter against your recent (so called) MOU [Memorandum of Understanding] with China Power. Why are you still pushing the project? Do you want further bloodshed and further human rights violations in Phulbari? What is your response to the communities that are hotly opposing the project? You have been banned in Bangladesh. Why are you not closing your office in Bangladesh? What are you doing there in reality? 3. Last year you (Gary Lye) said that you had a secret meeting with the Bangladesh government, and that the government was interested in giving GCM the go-ahead. Can you update us what’s new? The communities said that the government officials rejected your claim. Where and when did the secret meetings take place? Is there any further secret meeting to be held to bring some hope to the shareholders? Likewise, on 22 September 2016, the Energy and Mineral Resources Division (EMRD) secretary Nazimuddin Chowdhury publicly stated that: “We are giving up open-pit mining in Barapukuria”. The Energy and Mineral Resources Division took the decision as suggested by the outcome of a survey carried out by an independent consultant and a former official of state-owned Petrobangla, AKM Shamsuddin (see The Daily Sun, 22 September 2016). The survey shows that “There is a high risk for open-pit mining given the potential vulnerability of the vast arable lands in North Bengal that produces a large portion of the country’s granaries”. Government is following the suggestion to “step back from the decision of open-pit mining considering thickness of coal, coal seams and the potential risks to the aquifer inside the coal mining area at Barapukuria.” Given this, it is clear that you are unlikely to have any deal from the Bangladesh Government in the near future. GCM does not have any future in Bangladesh and GCM does not have any business elsewhere in the world. Why are you not telling the truth to the shareholders? On what basis do you sell shares in London Stock Exchange? 5. You have recently put on a notice of a so called MOU with China Power – the notice appeared on GCM’s website on 28 November, after a long quiet period of no news of the company. Why was there no news for a whole year since the last AGM? Why was your share price going down? You have lost credibility and market confidence. You have been borrowing money and facing continuous loss. Why is this dire situation? How do you wish to recover from this dire situation? Can you explain? A climate emergency has recently been declared in the UK. Since October 2018, a global movement, led by peoples’ power – organised by an extraordinarily powerful international collective called the Extinction Rebellion – is underway. The UK government has been considering reducing the use of coal and fossil fuel. When the UK government has a clear position to end coal fired energy how do you rationalise promoting coal based energy and open cast mine overseas? By doing so are you not breaching the position of the UK government? 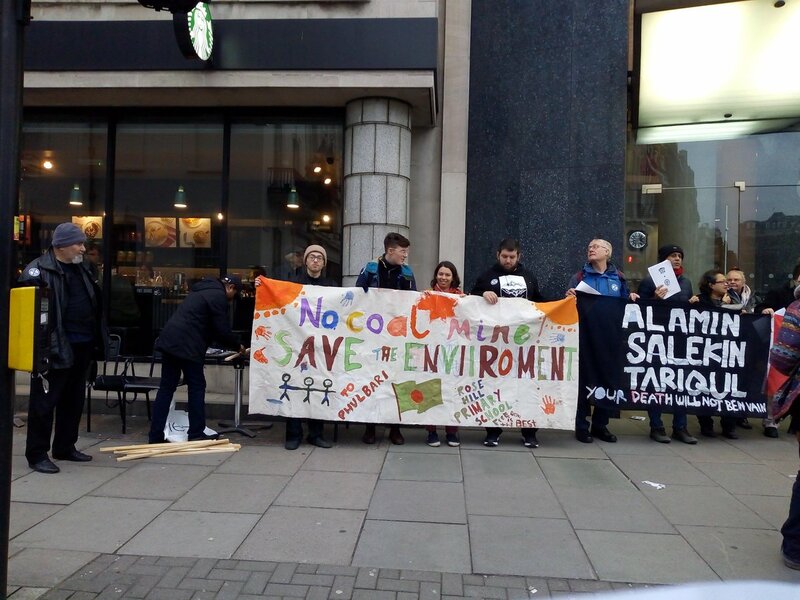 If coal based dirty energy is not fit for the UK, how would you justify coal extraction in Bangladesh? In the COP24 climate summit in Poland, climate change was again placed at the centre of global diplomacy. Global leaders have expressed grave concerns about carbon emissions and acknowledged the need to prevent climate change by reducing carbon emissions and coal-powered energy. It is predicted that if carbon emissions increase, global warming will be even worse. Compared to Europe and the developed world, Bangladesh is relatively vulnerable to climate change. If global warming increases, the rise in sea level will increase, and Bangladesh will be the worst victim of this situation. 30 percent of the coastal area will be submerged. Given this, do you still intend to lobby for an open pit mine in Bangladesh? Do you see that any attempt to extract coal in Bangladesh would produce more threats to the climate, and would put Bangladesh in a total climate disaster? This issue was raised in last AGM but you failed to address the question adequately. Can you explain your exact position today? 7. Bangladesh government said that Dhaka will be fossil free by 2025. Are you aware of this declaration of Dhaka? What’s your position in relation to Bangladesh government’s reassurance to the protesters in Phulbari? Do you still wish to continue misleading shareholders about the company’s future? How correct is it to accumulate money from the share market when there is no official deal with Bangladesh government? Page 4 of this year’s annual report says that around 40,000 people will need to be removed for the Phulbari project, 12,000 of them to a new town extension and the remainder to new villages or other parts of Bangladesh. Other estimates place the number of people removed very much higher. The annual report says that only around 17,000 jobs will be created. I have been working for the past 18 years with communities being relocated to make way for the Cerrejon coal mine in Colombia. This mine is owned by three of the largest, most experienced multinational mining companies in the world – Anglo American, BHP and Glencore. The number of people being relocated as the mine expands is considerably lower than 40,000, and there is much more space for them to be relocated to. Nonetheless, the relocations have been dogged with difficulties and conflicts, many people have lost their livelihoods, most new productive projects set up with the company’s help to replace traditional livelihoods have failed, and the whole project has been accompanied by continuous litigation on behalf of affected communities. What makes you so confident that GCM, with far less experience and capital than Anglo American, BHP and Glencore, can achieve what those companies have signally failed to achieve in 18 years of trying? I have asked you about this matter before, and I did not receive an answer. Please could you answer now?